The genus Nomascus are one of the four genus that occurs in the Hylobatid family. Males have erect crown hair thus giving this genus its common name, crested gibbons. Crested gibbons are sexually dichromatic; males and females of the same species have different fur coloring and markings.The males tend to have black fur while females have orange to yellow fur. All species of Nomascus are either endangered or critically endangered. Like all gibbons, their trademark is their species-specific songs that they sing to communicate to each other. These songs, unlike those from song birds, are instinctual and are not learned (Thinh et al., 2011). 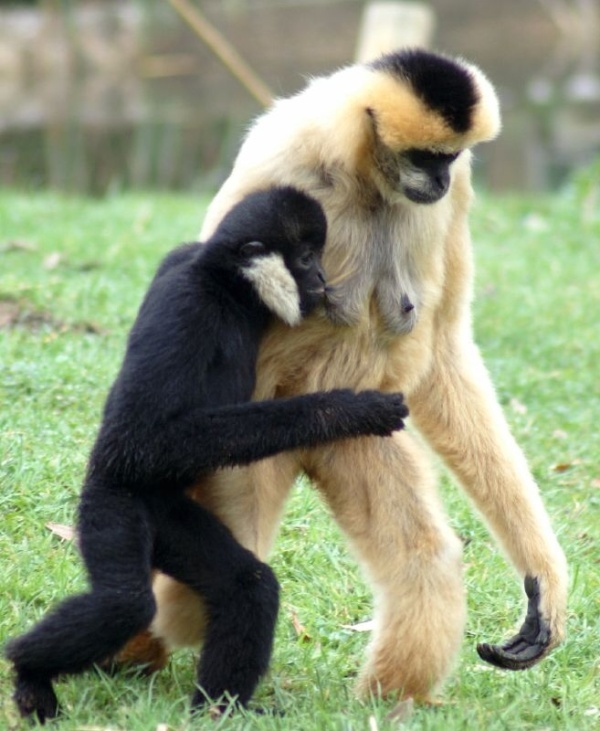 Gibbons are the only monogamous ape. Nomascus leucogenys mother and male offspring. 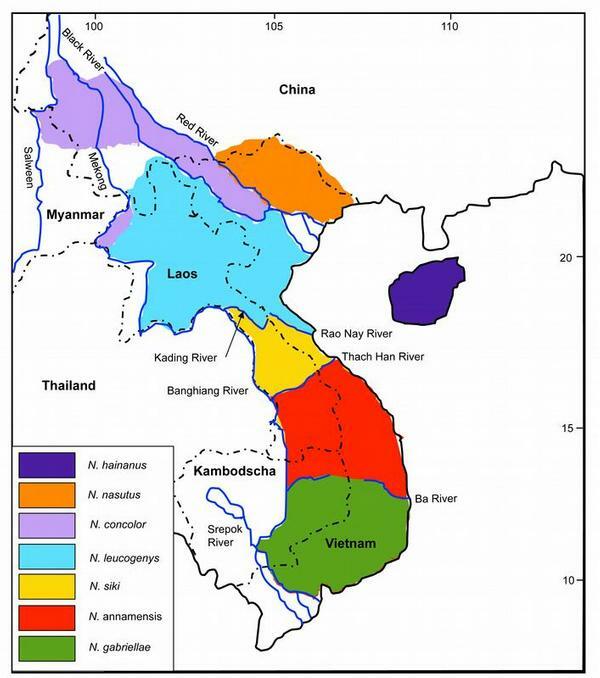 A new study, published this month on BMC Evolutionary Biology by Thinh et al. (2011) found that crested gibbons have species-specific song that can be used to differentiate the Nomascus species and also predict the phylogenetic relatedness of this genus. In this study, 6 Nomascus species were used as analysis: N. nasutus, N. concolor, N. leucogenys, N. siki, N. annamensis and N. gabriellae. The researchers used 92 out of 175 song recordings for acoustic analysis, analyzing 440 great calls (duets between males and females) and 447 male calls from 92 gibbon groups at 24 locations to confirm the relationship between song structure and phylogeny in Nomascus. Video of Cao Vit gibbons (N. nasutus) singing. Notice the sexual dichromatism that occurs in males and females. The researchers were able to tell the 6 Nomascus species apart by just listening to their song acoustics, albeit some with greater difficulties than others. N. nasutus and N. concolor could clearly be identified from their song acoustics. N. leucogenys, N. siki, N. annamensis and N. gabriellae on the other hand, have songs that are similar in structure but with minute differences. They also found a significant correlation between song structures and genetic similarity, which means that Nomascus species that are more closely related have similar song structures. This would account to N. leucogenys, N. siki, N. annamensis and N. gabriellae having same song structures but with minute differences in them because they are very closely related. The authors also found that song similarities among species correspond to geographic location. They found a large difference in song structures between the most northern species and the most southern species, and a gradual difference when compared from the northernmost species to the southernmost species. This gradual difference in song structure, from the most northern species to the most southern species, supports the hypothesis that the genus originated from the north and successively migrated to the south. N. hainanus (omitted in the study) and N. nasutus are basal among crested gibbons (Nomascus). Together, these two species form a clade. 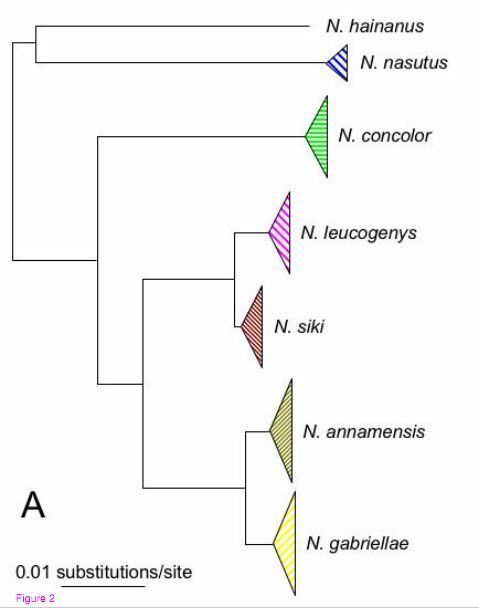 N. concolor branched off first, then following by the rest of the Nomascus species; N. leucogenys, N. siki, N. annamensis and N. gabriellae. The cladogram of the genus Nomascus. Illustration from Thinh et al. (2011).